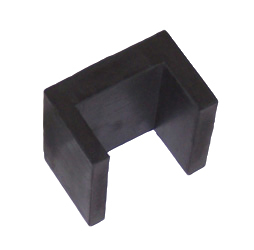 Rubber Stud Isolators are an affordable and effective way to decouple walls and ceilings. Simply attach to studs and continue construction and experience improved performance to any construction method. Extruded shape to fit wood beams & studs. Floor/ceiling wood beam isolators, wood stud isolation. 2 1/8" wide x 1 1/2" high x 2" long. Friction fit over stud/beam faces - install 16 o.c.